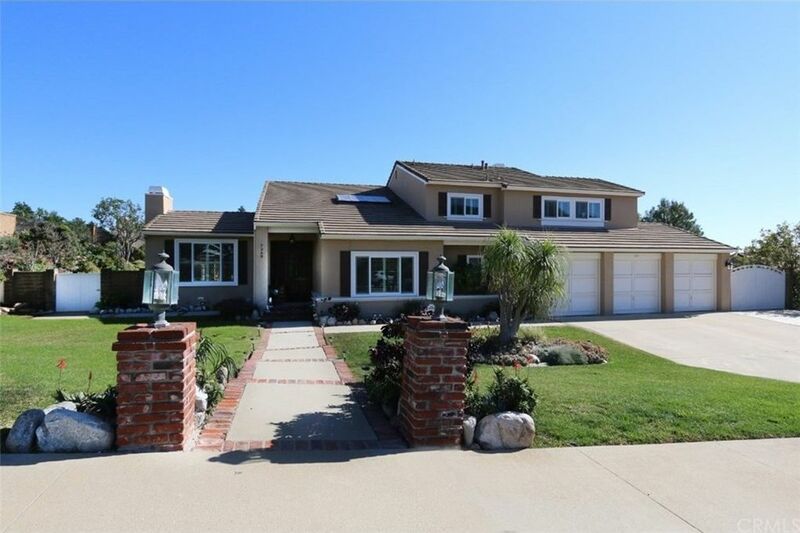 This beautiful, 2-story, 6 bedroom, 3 bath home is located in the highly desirable Rustic Canyon Estates in North La Verne! The large 2, 882 square foot home is situated on a spacious 15, 096 square foot lot. The formal living room has cathedral ceilings, an elegant fireplace, and French doors that open up to the backyard patio. Additional home features include central air, a security system, Hunter Douglas plantation shutters, hardwood floors, and a whole house fan. The kitchen was remodeled in 2018 and features quartz counters, a built-in triple oven, a breakfast nook, and recessed lighting. This well-maintained home has 1 bedroom and 1 three-quarter bathroom downstairs. Upstairs, are 5 bedrooms, including the master suite, and 2 full bathrooms. The house also has a family room, a bar, and a laundry room. Copper plumbing throughout. The property has a 3-car attached garage. The large backyard features mountain views, a huge patio, a nice lawn, fruit trees, and plenty of space for those backyard get-togethers. If you love to entertain family and friends, you'll love this home! Directions: Cross street is Golden Hills Rd.